You created questions for your form, and now you’re thinking about form design: the background design and colors. You want the form to have a bit more visual pop. How do you get that? Use themes! 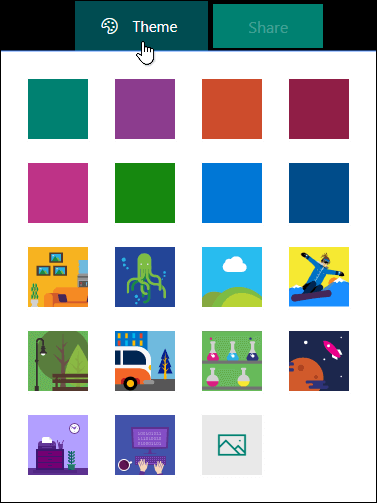 In Microsoft Forms, open the form for which you want to change the theme. Click Theme at the top right of the design window and pick the color or background you want. Image Search - Enter your search text in the Bing search box, and then click the Search button to see your search results. Pick the background image you want, and then click Add. OneDrive - Click the OneDrive folder that contains your image. Select the image, and then click Add. Upload - Navigate to the folder that contains your image. Select the image you want, and then click Open. If you want to replace the image you selected with a different one, click the trash can icon on the current image, and then click the Upload image icon to start the process over.